“One customer well taken care of, could be more valuable than $10000 worth of advertising”, said Jim Rohn. Each one of us will acknowledge the above quote, for customers are the “eyes” of the “business apples”. In every business, it is of prime significance to cater to the needs of the customer, and service in the right way. This enables in gaining the customers’ trust and can help a business go miles ahead. 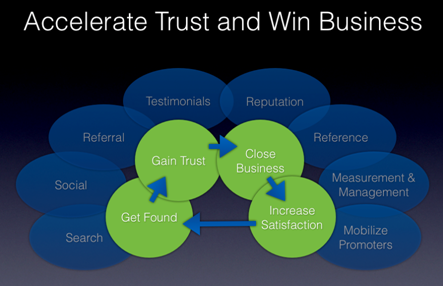 In today’s competitive world, every business is trying to attract customers and gain their trust. It is highly important for companies to gain the loyalty of the customer to increase their profits. It’s a virtuous cycle of getting noticed by a customer, gaining their trust, closing the deal and increasing their satisfaction! Building a rapport with a customer takes time, and requires meticulous efforts to maintain personal data private. A survey carried out on 1,000 British consumers revealed that 95 percent of those surveyed would cease to do business with a company if it handled their private details irresponsibly, got them wrong, passed them to third parties, failed to keep them secure, or otherwise abused their trust. However, gaining customers’ trust is not only about keeping the data secure, but is also about putting the data to efficient use to benefit the customer and tailor the business or the product according to their needs. This helps in creating a spell-bound journey and an awe-inspiring experience for the consumer. Today, businesses are effectively using the internet as a medium for marketing and sales. This has led to an exponential increase in the number of customers, as more and more people are going online to search for the “best-fit” product among a plethora of options available to them! Every company tries to attract “the best of the lot”. Therefore, it is important to interact with customers in the best possible manner online and win their trust. Businesses interact with customers online in two main ways namely, text customer service chat and video or voice assistance. Text Support mainly involves a Live Chat Support Software on the product’s website. The customer can type in few sentences and chat directly with the representative, or can leave an offline message for the representative. The video and voice assistance involves the customer talking to the representative directly. This makes it easier for both the sides to exchange information easily. The customer can express himself in a better way for he does not have to be proficient in the written language. He must just be able to talk. • Video Interactions help the business and customers recognize each other effectively. Looking at each others’ eyes definitely increases the compatibility levels, as understanding the body language leads to more clarity in conversation with the customer. This leads to better service and increased trust by the customer. • Live Video Assistance is quicker when compared to typing out long text messages and waiting for their reply. This leads to a reduction in the overall time. Therefore, the customer starts trusting the business more than before, as he now believes that they are swift in their operations. • Verbal Interaction offers better comfort to the customer. Doubt clarification is easier and live video interaction helps the customer in effectively conveying his needs, and the business in answering them. Thereby, the customer starts trusting the business. Hence, video interactions help increase the customers’ trust on a business. 1CLICK offers Live Video Assistance directly on a browser and a widget that can easily be embedded into your website. Go ahead and improve your customers’ trust, by embracing Video Chat Support. This entry was posted on January 28, 2015 by Clifton Lobo in video calling software for business and tagged video interactions to build trust for your business.